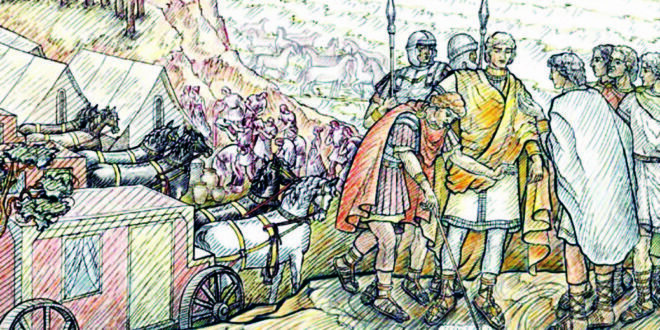 A Roman entourage on an amber procurement mission at the Baltic shore. 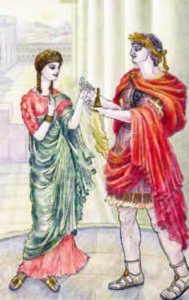 Emperor Nero presenting an amber figurine to his second wife, Poppaea Sabina the Younger. Aestians is the name given to people living to the east and south of the Baltic coast in the general region of Klaipėda by the Roman historian Tacitus. The history of the Aestians or aisčiai, our ancestral people, is a fascinating puzzle full of charming details of daily life and intriguing glimpses of a larger picture. Hopefully, in the future, information about their life in the first millenium after Christ will become better interconnected to form a more complete story. For the moment, we present fragments from Greek and Roman writers who either encountered Aestians or simply wrote about what they heard about them from travelers during this very early period. 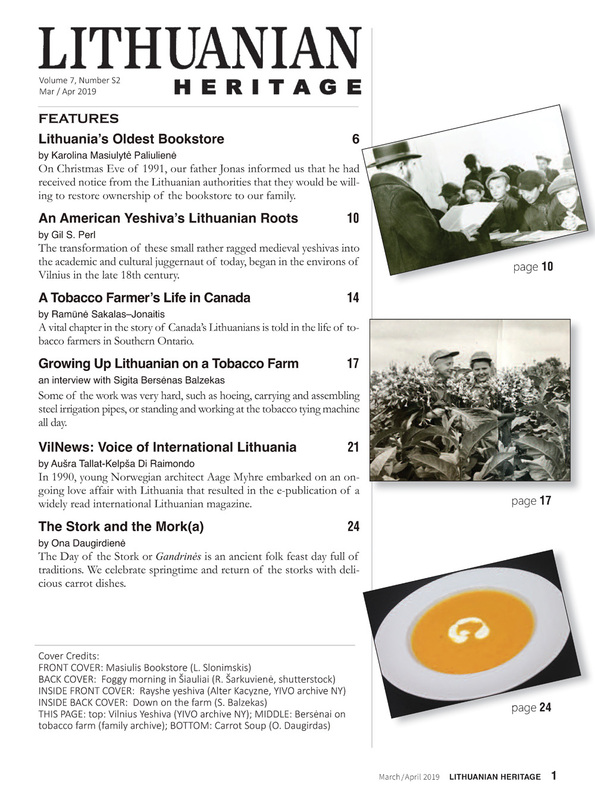 The following excerpts are based on my book published in Vilnius in 2016 titled, “Aestians Illustrated (Iliustruoti Aisčiai), the beginnings of Lithuania and Lithuanians.” The text is creatively illustrated by graphic artist Laima Tubelytė-Kriukelienė. Pliny the Elder, who lived 2379 A.D., wrote of a mission ordered by emperor Nero to procure and bring back quantities of amber from the north. Although trading in amber between the southern continental civilizations and the Aestians had been going on for thousands of years, this expedition was the first one documented in a written chronicle. Pliny was a contemporary of Nero, who ruled the Roman empire from 54 to 68 A.D., and so it is reasonable to assume that his accounts are reliable. According to my research, the amber-gathering mission took place in the year 59 A.D. The travelers brought back to Rome large quantities of amber, including an enormous stone weighing 13 pounds. Pliny’s accounts give us a sense of the extreme value the Roman world placed on amber and the jewelry made from it. He tellingly writes that the price of a small amber figurine surpassed that of a live and healthy person – at the time, the price tag on a literate slave was about 2050 sesterces, or $5,500 in today’s silver. Sabina with a figurine carved in her image, and in one of his poems used the word “amber” to describe the color of her hair. That description resulted in the ladies of the realm adding a third option to the list of most desirable hair colors! Tacitus, the Roman senator and historian (56–117 AD), wrote about the Aestian people who collected amber from the seabed as well as from the seashore and shallows. He referred to amber by the name glesum. Tacitus thought the Aestians to be rather naive about the value of amber, stating that they had no use for it. He writes, “To themselves it [amber] is of no use: they gather it rough, they expose it in pieces coarse and unpolished, and for it receive a price with wonder” (Germania, chapter XLV). Tacitus may have simply been disparaging the trading acumen of the foreigners in order to burnish the image of Roman buyers. Our ancestors, the Aestians, certainly knew the value of amber. They traded it from times of antiquity, as evidenced by amber artifacts found in Cretan, Mycean and Etruscan cultures. And they traded amber on a large scale, making them wealthy and well-known in the civilized world. Payments for transactions were in the the form of precious metals and other luxury items, remains of which have been found by archeologists in the farthest reaches of Aestian lands. 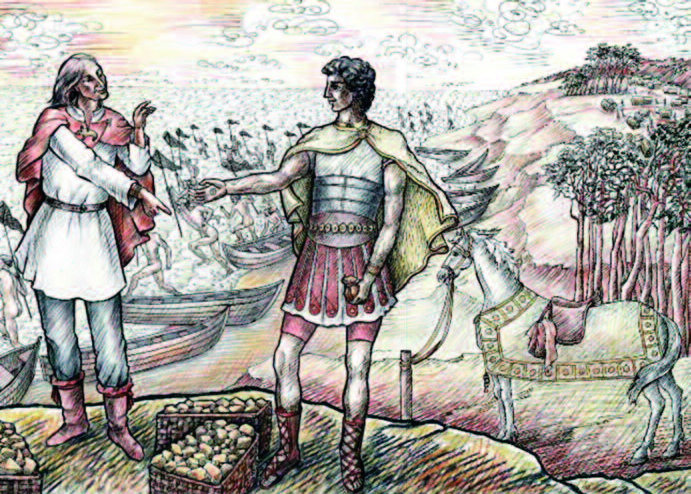 An Aestian amber seller driving a hard bargain with his Roman buyer. The map shows a portion of the shoreline of the Baltic Sea from the Oder River of western Poland to the northern edge of Latvia. Historically, this area has been an especially rich source of amber. The scattered round images represent archeological burial sites where Roman coins have been unearthed. Note that the locations and density of places where these Roman artifacts were found corresponds to the areas of highest amber concentration – the Prussian lands of the Semban peninsula and the Lithuanian coastline. These Roman coins, which were probably acquired as merchant payments, are evidence of an active and extensive amber trade in the region. Horsemen were members of a priviledged Roman class, and Pliny’s specific mention that the head of the expedition was one of them, indicates the important status of the mission. He writes that multiple trade routes and seashore sites were visited, and great quantities of amber procured. This simple statement implies that the Roman convoy was impressively large and must have included soldiers, traders, translators, and a of course, a supporting contingent of slaves. Upon return to Rome, the amber cache was put to quite unconventional use in the gladiator arena. Every knot in the nets protecting first class seating from the wild animals in the arena was studded with amber, the funeral stretchers were decorated with amber, all the accessories and implements designated for that day’s spectacle were encrusted with amber. And even the “sand” in the arena was made of amber! Map showing the amber-rich Aestian seashore and places where burial sites have yielded old Roman coins. Pliny the Elder alludes to the extensive trading network that was present in Aestian lands, writing about numerous markets (Latin – commercia). This marketplace network was not only well-developed but had an international flavor. Based on written chronicles and archeological findings, it seems that the merchandise traded in these markets came from both the Aestian world and from Roman master craftsmen. Roman tableware, ornaments and jewelry, nonferrous metals and other items have been uncovered at Aestian archeological sites. It is also probable that the slave-based society of ancient Rome was able to supplement its slave population during visits to Aestian lands. An Aestian marketplace on the Baltic seashore. Claudius Ptolemy was a Greek writer, mathematician and geographer who wrote several scientific treatises. One of his main works is Geographia, a compilation of geographical co-ordinates of the part of the world known to the Roman Empire during his time. A map (drawn in the Middle Ages) of Sarmatia in Europe, according to Ptolemy’s mid-second century description, has been a source of fascination and debate for scholars. The fugitive Palemonas and his entourage fleeing Nero’s persecution. On the map drawn according to Ptolemy, rivers named Chronas, Rudonas, Turuntas and Chesinas are indicated, located in current Baltic lands. Over the years, researchers have proposed many hypotheses about which modern day rivers these might correspond to. 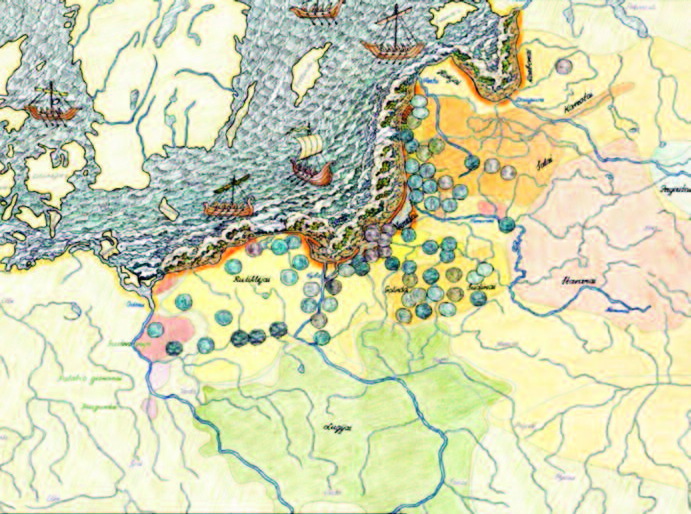 With the assistance of mathematical and geographic tools, there is basis to assert that Chronas corresponds to the river Nemunas, Rudonas – to the river Venta, Turuntas to Dauguva, Latvia’s largest river, and Chesinas to the Pernu river, one of the major rivers of Estonija. Ptolemy mentions five tribes residing in the Western Baltics: Venedai, Galindai, Sudinai, Veltai and Salai; three Baltic Finn tribes: Hosijai, Karbonai and Kareotai; and four Eastern baltic tribes: Stavanai, Pagiritai, Savarai, and Boruskai. Palemonas: Do we have ancestral Roman roots? 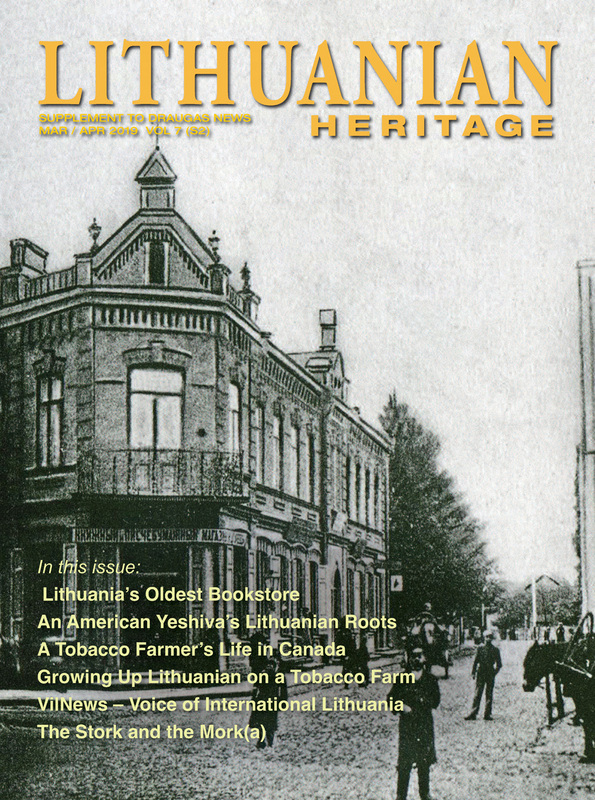 The legend of Palemonas is the source of one theory claiming that Lithuanians have Roman origins. It is said that due to Nero’s persecution, Palemonas fled Rome and found himself in the lands of Lithuania, where he fathered three sons: Barkus, Kunas ir Spera. Barkus would have built the castle of Jurbarkas and governed the surrounding lands. 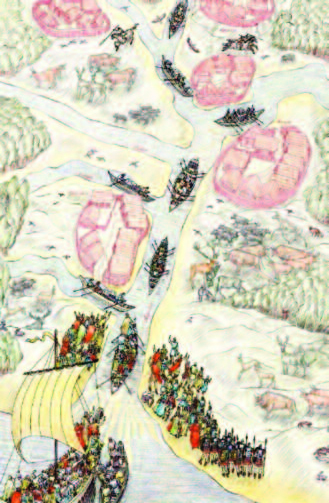 Kunas is said to have governed the the area around what is now Kaunas, and the youngest son, Spera, is said to have governed lands to the north and east. Kunas’ son Kernius founded Kernavė. Palemonas himself is said to be buried in the castle hill of Seredžius, which to this day is known as Palemonas Hill. 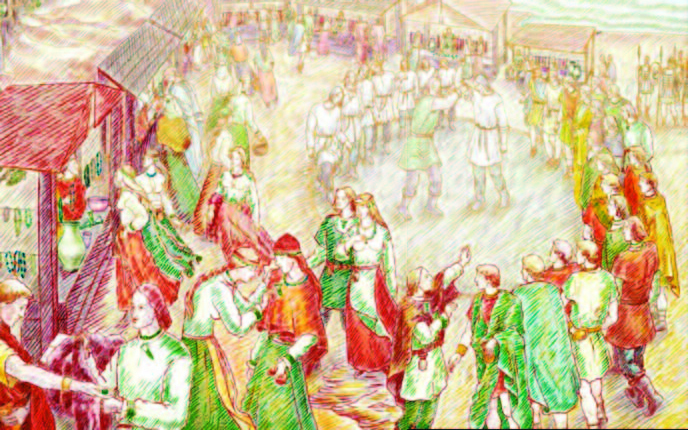 Palemonas’ highborn descendants are said to include the entire princely Gediminaitis dynasty and the noble families of Goštautas and others. 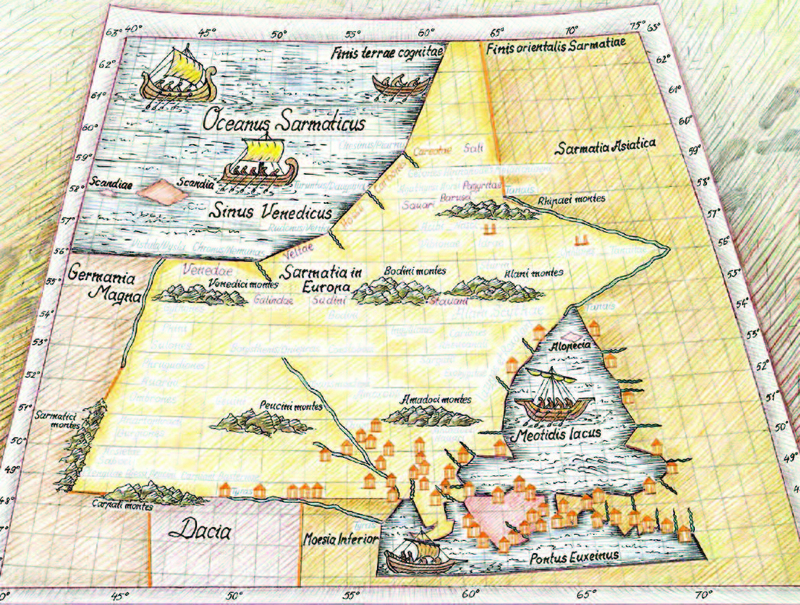 Map of Sarmatia drawn (in the Middle Ages) according to writings by Ptolemy in the second century A.D. The “Galindae” and “Sudini” tribe locations are visible just below “Sarmatia in Europa”. Editor’s note: The post has been modified to clarify that the map drawn based on Ptolemy’s writings was not drawn in the 2nd century, but during the Middle Ages.